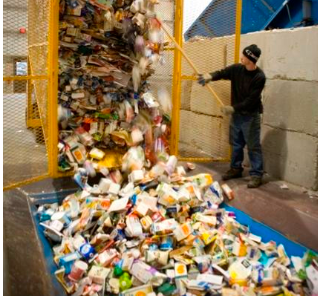 An Emmet County worker pushes the recycling onto the conveyer belt. Michigan recycling programs have been struggling since China stopped taking U.S. plastic materials last year. Jim Malewitz explains how China's decision has impacted recycling in Michigan right now. But Emmet County recycles their products in-house, so they haven't been affected as much. Jim Malewitz, the environmental reporter for Bridge Magazine, has been following their program. He says Emmet County pays to haul materials to its own recycling center, then collects revenue from recycled products. Other communities don't have their own facilities and now have to offload their recyclables to waste collectors who want to charge more. Malewitz says this is causing many of them to reconsider their programs. Before he left office, former Gov. Rick Snyder signed legislation that will send $15 million to municipal recycling programs this year. "The idea is to use some of that money to set up local markets to unload these recycled materials," Malewitz says. "Some of this money will go towards educating recyclers about how best to dispose of their materials so they're not contaminating the waste." He says, in the meantime, rural areas who want to keep recycling may look to Emmet County as a model.